So, when EU leaders were cajoled by Germany’s Angela Merkel into joining the United States in applying sanctions, Russia could do little to retaliate from within the oil sector. In reality, it is the EU and the U.S., not Russia, that have an “oil weapon” in hand. And, the flurry of Russian oil diplomacy with OPEC, Iran and China over the past couple of weeks has a distinct whiff of desperation to it. Consider OPEC: Here, Igor Sechin, chief of oil-giant Rosneft, and other officials have been talking with OPEC members from Venezuela to Saudi Arabia. It’s difficult to see what Russia hopes to gain here. Moscow coordinating with OPEC to cut production and boost the price of oil seems unlikely. Russia has never cooperated with OPEC cuts, even though OPEC has occasionally reached out to Moscow. For example, in 2008, Russia promised to cut production in support of OPEC, but instead increased output in 2009, freeriding on OPEC’s cuts. Last November, when Saudi oil minister Al Naimi was repeatedly warning that OPEC could not cut enough oil on its own to reverse falling prices, he met with his non-OPEC Mexican and Russian counterparts. However, both demurred from joining any OPEC cut. So, instead of cuts, the Saudis convinced OPEC the only alternative was to increase production, forcing prices even lower to drive higher-cost producers from the market, thereby at least boosting OPEC’s market share. Today, Russia’s oil-export revenues are under such pressure from sanctions and low prices that the country has taken to “consulting with” (i.e., lobbying) the Saudis to change OPEC policy. However, even if Putin were to promise to cut production together with OPEC in order to push the price back up—Al Naimi would rightly be skeptical. According to Al Naimi, the reason the Russians gave for not being able to cut production last November was that the low-temperature of their west Siberian fields dictates Russian production cannot be cut back without ruining those fields. So, unless Siberia has recently warmed up, the only way Putin might undo OPEC’s policy is to cut his support for Syria’s Bashar al-Assad, which the Saudis have publicly suggested. 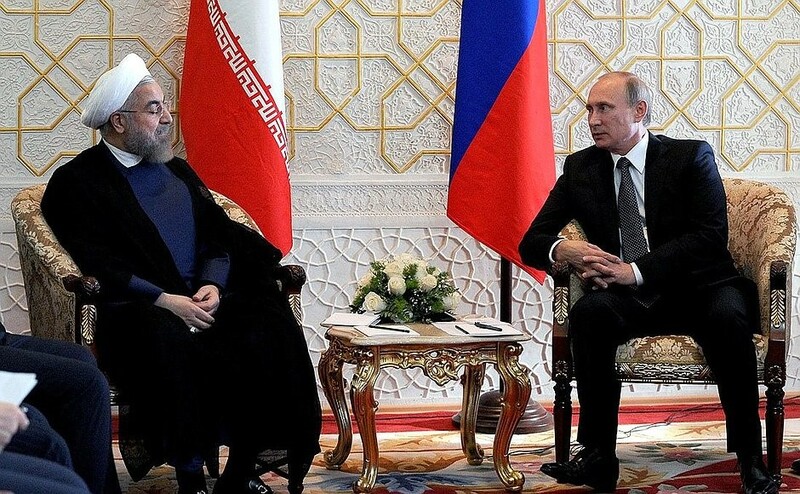 Then there is Iran: In mid-April Putin once again announced a deal to barter Russian food and industrial goods for Iranian oil (he has gone back and forth with this scheme for over a year). He also lifted the ban Russia imposed in 2010 on exporting its S-300 missile systems to Iran while the P5+1’s nuclear negotiations are still underway. On one hand, Putin’s dual offers to Iran work to embolden it in the still-continuing nuclear negotiations, thus possibly undermining U.S.-EU efforts (although Russian manufactures say it would take at least six months to fill the missile order once it’s received). Yet, on the other hand, the barter would appear to place Russia first in line for Iranian trade when, and if, a nuclear deal is completed and Iran’s sanctions are lifted. However, there is no need to spend too much time unraveling a Russian policy that is apparently at odds with itself as, almost immediately, Russia and Iran each issued caveats to the barter deal, with a Russian minister even denying oil would be involved. Once again, one senses an air of desperation here. So, too, with China: There is a promising new large oil field, Vankor, in the northern Siberian tundra. U.S. and EU sanctions, imposed in March 2014, block western companies from participating in developing unconventional oil fields, including in Arctic waters, deep offshore fields, and shale strata, all of which Russia was counting on to replace its declining conventional west Siberian fields. So, in September, Putin invited the Chinese to directly buy a share and help to develop the Vankor field. This was seen as highly unusual, as Russia has rarely given foreigners such direct ownership stakes. However, as Reuters reported last week: “Vankor [is] key to Russian policy of tapping new regions.” Aside from the much-needed foreign capital (note that U.S. and EU sanctions also prohibit Russian banks and firms access to long-term western financing), the sad reality is that Russian oil firms lack the technology and managerial-organizational capacity to develop unconventional fields without western firms’ assistance. In other words, Putin’s failure to re-industrialize Russia also hamstrings Russia from remaining a competitive petrostate. Here too, in this China deal, lurks an air of desperation. 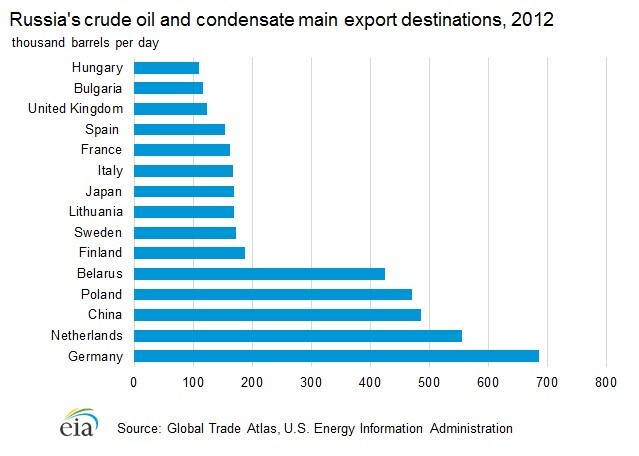 In the end, despite the fact that Russia has perennially been among the world’s top two or three oil exporters, supplying about 36 percent of the EU’s crude oil in 2013, and almost 30 percent of Germany’s oil (indeed, for decades, Germany, the EU’s leading economy, has remained more “dependent” on Russian oil than any other western European state), no person knowledgeable of how the global oil sector functions worries about any potential Russian “oil weapon” against Germany or the EU. So where does this leave matters? For one thing, Putin is certainly aware that should he decide to wreck the Minsk ceasefire by grabbing Mariupol or a significant amount of other Ukrainian territory, the United States and the EU would almost certainly ratchet up their energy sanctions to the next obvious level: blocking participation of western firms from producing conventional Russian oil. Such sanctions would be devastating. This entry was posted in AICGS, Aramco, China, Energy and Geopolitics, Energy and Geostrategy, Euroepen Union, Gas globalization, gas internationalization, Germany, Global Oil Market, Global Oil system, international relations, Iran nuclear, Iran sanctions, negotiations, Obama, Oil prices, OPEC, Putin, Rouhani, Russia, Sanctions, Saudi Arabia, shale oil, The USA, Ukraine, Venezuela oil and tagged Ali Al-Naimi, Berlin, China, European Union, geopolitics, Germany, Iran, Middle East, natural gas, oil sector, OPEC, Putin, Sanctions against Iran, Saudi Arabia, United States, Venezuela, Vladimir Putin. Bookmark the permalink. Interesting insight as always, Thomas. The Russians stand on production cuts is an important discussion if one are to try to draw some conjectures on the potential outcomes of the upcoming OPEC meeting in June. I did not know that the Russians defied their 2009 promises to hold back production, but believe such decision may be illustrative of Kreml’s thinking. Do you have any insight as to the Soviets/Russians’ degree of (legitimate) cooperation (or collusion?) in former collective OPEC cut-back periods, such as that (the most notable) of 1986, 1999 and 2002? In the case of the latter, I know even Norway joined in on the effort with a couple of hundred thousands barrels. I have also understood that the opposition to cutting production is (somewhat) legitimate in that it is challenging (but obviously not impossible) to facilitate due to midstream infrastructure bottlenecks and storage constraints. Generally, I have found it difficult to find much data on this. What is your take on this? The Saudis’ action, which the more I consider it, really appear to be a stroke of genius and (in hindsight) makes perfect sense. In my opinion, it is a win-win multifaceted approach with many long-term net benefits for the Kingdom and the oil market. Namely – in frank terms – 1) stimulate global demand, 2) weaken adversaries (Iran, Russia) 3) discipline OPEC peers (again); 4) defer oil substitute technologies (EVs, solar); 5) maintain/increase (Asian) market share; 6) increase attractiveness vis-a-vis natural gas. I think the last point may really be the nucleus of the discussion, although it has received little to none attention in the media. Natural gas is in plentiful supply and makes for a less politically sensitive story with its environmental benefits. LNG with its required massive long-term capital commitments, is getting closer to becoming a truly globalized commodity like crude oil. And although it has been prophesied for years, the use of NG in power generation and the transport sector has gotten momentum the last couple of years, with infrastructure and technology increasingly available for merchant vessels, truck/bus fleets, as well as railroad locomotives. Despite the oil price having halved, natural gas still has an undisputed commercial impetus being priced at about a quarter of a barrel of oil in terms of energy content (i.e. oil would have to be ~ $15/bbl to reach equilibrium in terms of BTU). I believe Al-Naimi and the Saud family more than willingly exchanged short-term fiscal losses/lower income, added price volatility and a lapse of market stability for another couple of decades of crude oil hegemony. With numerous potential pitfalls on the road ahead, it remains to be seen if the experiment will succeed. What is your thoughts on the Saudi’s strategic angle? Also, what do you think we will see out of the next OPEC meeting? And what is your medium term outlook for oil prices?